A month of events at Cafe Art on Royal Square in the centre of St Ives - focussed on the local community. 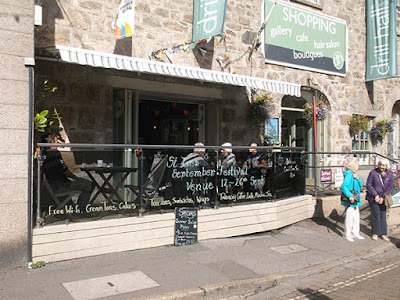 "For the whole month of February, Café Art in St Ives is hosting ‘Community Month’. Centering around the St Ives Charter, which was launched in 2017, there will be a lively programme of free events, meetings, workshops, crafts and more – bringing people together to celebrate our rich and vibrant community life. The St Ives Charter will be displayed on the walls, along with interactive maps of community organisations and the Charter itself, which individuals and organisations can read, sign and endorse." Sun 4th - 10.00 am – 5.00 pm. St Ives Skate Park - information and fundraiser. Mon 12th - 2.00 - 4.00 pm. Cornish Conversation for beginners “Yeth an Werin”, informal drop-in. Wed 14th - 6.00 - 8.00 pm. Cornwall Writers Group - informal group, all welcome. Fri 16th - 7.00 - 9.00 pm. St Ives Charter Evening. Community Quiz, cheese and wine. Sun 18th - 11.00 am - 3.00 pm. Lino Cutting and Printing with Mars Martineau-Low. Mon 19th - 2.00 - 4.00 pm. Mon 19th - 5.30 - 7.00 pm. Talk: History of St Ives, by Janet Axten. Wed 21st - 7.00 - 9.00 pm. St Ives Mariner - 50 Years at Sea - a talk by Master Mariner Eric Kemp. Fri 23rd - 2.00 - 4.00 pm. Stash Swap - for crafters, sewers and knitters. Get rid of unwanted stuff, swap it for more useful stuff! Sun 25th - 10.00 am - 4.00 pm. 11.00 am - Flower Felting Workshop. 3.00 pm - Talk: Bees and Trees. Mon 26th - 7.00 pm. Film “Ghost Town”, housing and community in St Ives. Wed 28th - 2.00 - 4.00 pm. St Ives in Stiches - Community Sewing Project. Every Tuesday - 3.00 - 5.00 pm. Knitting Group - all welcome. Every Thursday - 3.00 - 5.00 pm. Drawing Group - all welcome.